Natalie Gahrmann is the expert that helps SuperBusy Business Leaders, administrative professionals and rising stars increase performance by decreasing distractions! Coming from the perspective of a high achiever who used to overfill her own plate, Natalie teaches others how to better manage all of their personal and professional obligations so that they can concentrate on what is truly important to them, while minimizing the distractions that can take them off-task. 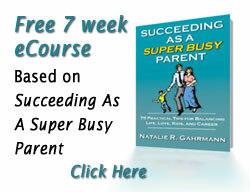 With numerous, national and local media appearances and an award winning book: Succeeding as a Super Busy Parent, under her belt, Natalie Gahrmann’s profound wisdom and actionable strategies will help you, not just juggle what is on your plate, but better manage expectations, attention and obligations. Natalie is a former Board member of the National Speakers Association and President of the NJ Professional Coaches Association. She holds a MA in Administration & Supervision and a BS in Marketing Education. Natalie earned her coaching certification through the International Coach Federation and Coach U. She is the founder and owner of N-R-G Coaching Associates, an international coaching and training company and an expert contributor to Parenting Magazine, BlueSuitMom, Momtourage (an iVillage site), and MyPath (Guided by Manpower, a global leader in employment services).